Having completed the previous steps, you may now proceed with the enrolment. Note, that you have to enrol before 31st October (WS) or 30th April (SS), you can do it individually or in a group with our tutors. Usually, the enrolment period lasts three weeks and starts a month before the beginning of the lecture period. Additionally, a separate enrolment date will be arranged for students of the Master Programme with the Student Records Office. It will be during the orientation week and we will travel to Erlangen together. The „Studentenwerksbeitrag‚“ of 42 EUR + 74 EUR (Basic ticket VGN) has to be paid by ALL students, also by the exchange students. – Tourist visas will not be accepted! – If you only have a tourist visa you must apply prior to enrolment for a provisional residence permit with the Foreign National’s Registration Office of the City of Nuremberg. Proof of health insurance: proof can be obtained from your health insurance. Proof of exemption from the statutory health insurance must be provided if you have private health insurance. Presenting a chip card or a simple membership certificate will not suffice. For further information please ask your health insurance. Enrolment will be denied if sufficient proof is not provided (Art. 61 Paragraph 1 # 8 BayHSchG). Each student will receive a remittance slip after enrolment with which the fee of €116 can be paid. 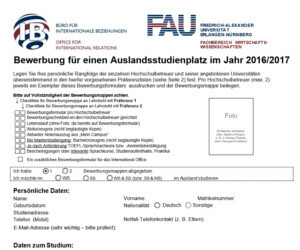 Students will receive their final student documents (FAU-card, Wifi-login, etc.) after receipt of payment. Most import of all is the Student ID card. It contains the student identification number. This number is for example required to sign up for language courses (language center), sport classes and for exams. It also contains information on your email address and your login for the university computers. Important: You must re-enroll after every semester otherwise you will be irrevocably exmatriculated! Students can re-enroll by paying the semester fee . 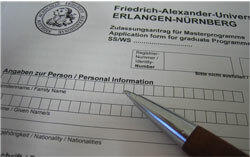 The necessary bank transfer form can be found each semester on “mein campus”. An academic leave of absence must be applied for in person at the Students Records Office. You will then have proof of acceptance to the University of Erlangen-Nuremberg. 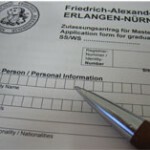 “Mein campus” (http://www.campus.uni-erlangen.de) is a university portal where students can download important documents and sign up and withdraw from exams. A withdrawal from an exam is only possible up until one day before the exam. Furthermore, students can change their address and contact information via the portal. They can also print out Student ID cards and proof of enrolment certificates.